For years, it has always been my goal to hunt turkeys. 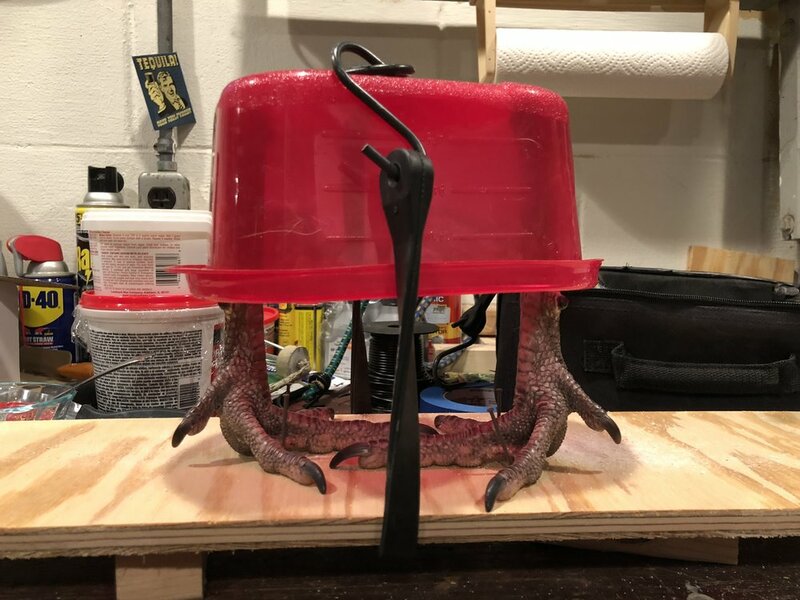 With the lower availability of public land (compounded with my lack of knowledge of where these birds are roosting throughout the state), my inexperience with turkey calling and not owning appropriate equipment such as ground blinds and decoys, I simply never took the proper steps forward to make it a reality. Then, in April 2018 everything came together. My good friend and co-worker Xai who has a lot of experience hunting turkeys invited me take part in a program called Waupaca Learn To Hunt. In the program, he became my mentor. We attended a class earlier in the week at a local (modern giant) farm where I learned the basics of turkey hunting such as regulations and advice/tactics. They allowed us to sight in our shotguns and check our shot patterns on their land. Pizza was delivered, Cabela's grab bags were given out filled with hunting books and magazines, turkey calls, knives and more. Lastly, we received our turkey tags and that was the evening. Thanks to awesome sponsors, volunteers and Wisconsin DNR, everything was FREE of charge, including the tags! On Saturday morning (April 7, 2018) the mission began. I woke up at 1:30 AM, packed the 4Runner and headed off to pick up Xai before heading to Waupaca County. Once we arrived at our private plot, we geared up and hiked through the forest and corn fields to get to our spot. It was a brisk morning - 13 degrees and accounting for the wind, it felt like 5 degrees. The moon was out with a million stars and the sky was black. Snow was on the ground... between that and the cold temps, we were not experiencing usual conditions for spring turkey. Earlier in the week we did some scouting and found out that our turkeys had moved to different fields than previously known, likely because of the different snow levels which affected their ability to scrape up last seasons corn. Had we not done this initial step, we may have been hunting on bird-less land. 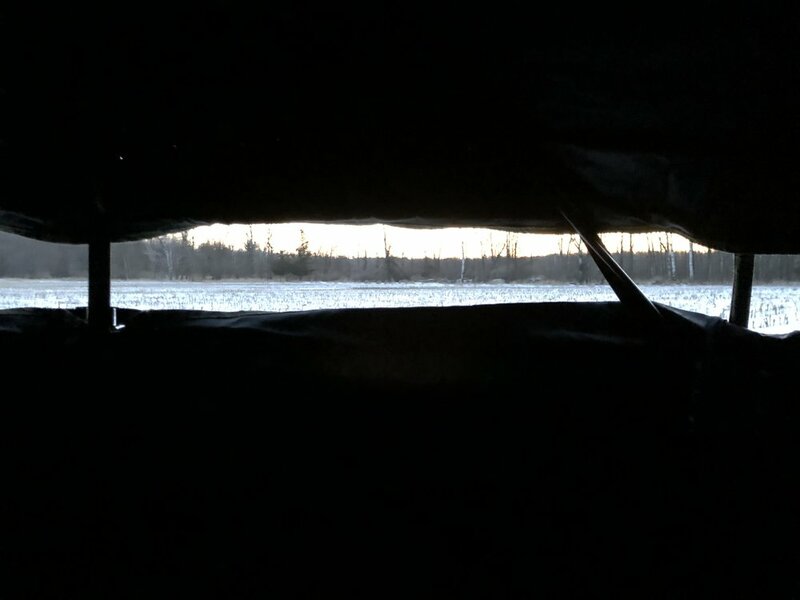 We placed our blind inside the edge of the woods on spot #2. The earth was so frozen that the stakes for the decoys would not hammer into the ground, so we had to ditch the stakes and put the turkey decoys on mounds of snow which was a bit hilarious. Post sunrise, Xai began to do some light calling. I was told because of the extreme cold that they may not be gobbling back to us which turned out to be true. Later in the morning we were lucky enough to fire up a small propane heater. This helped us get a through the morning a little easier, though it wouldn't be long until the mission was over. Around 7:30 AM, I noticed 4 jakes walking into the field from out of the forest. I told Xai who immediately got his camera running. I readied the gun and we got real still. I learned that turkey's were insanely good at detecting any movement. They began walking our way but soon were spoked and ran away from our blind. Luckily for me, one of the braver jakes came back towards us. Everything was happening quickly. Remember that propane heater? It turns out the moisture that it was producing began fogging up not only his camera lens, but the red dot scope on the shotgun. As I raised the gun, I realized it was a bit difficult to properly aim and was quickly trying to troubleshoot with Xai in the blind. The good news is that the jake got close enough and stuck his head out in the right way so that I could clearly see his silhouette against the white show. I wasn't exactly sure how close I should let the jake come in before I fired off a shot. Despite watching YouTube videos, I just didn't have the experience like I have had with deer to know how they can react. I asked Xai if I should take the shot in which he quickly replied "Kill 'em! Kill 'em!". It wasn't more than a half second later I pulled the trigger and watched my first turkey hit the snow. Success! Video Xai put together covering some of the hunt! It was an incredible experience and could not have gone any better. I was able to learn a lot and take a beautiful bird all within a pretty short time period which sometimes is not how my other hunting seasons go! We brought the bird back to the farm, had lunch and got to see the rest of the hunters and their gobblers. Xai gave me some great pointers on cutting all the meat out, some awesome recipes like turkey schnitzel and informed me how I could dry the feet, the tail fan feathers and the beard so I could save a little something for the memories. My family was fed for a week with fresh meat, I'm now addicted to the sport and cannot wait to get out and do it again! Amazing experience and another thing checked off the bucket list!